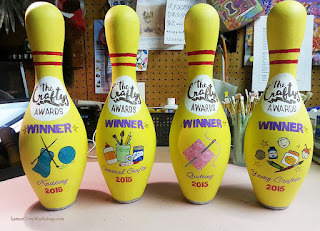 Today I have the pleasure of introducing you to Brenda Cook, the talented artist behind those stunning bowling pin trophies given to the winners of The Craftys. Brenda runs Lemon Tree Workshop, producing custom hand-painted glassware and gifts. Cindy: Brenda, thanks for agreeing to an interview! Tell us a little about yourself. Brenda: Okay, where to start… My first non-commissioned mural at the age of 3 done purely by crayon was a brilliant success until Mom came home from work and took a look at her bedroom wall. My first solo exhibit singling me out amongst my kindergarten peers involving a ship with smokestacks surrounded by air and sea creatures lead to a fit of hysterics (she only tacked my piece to the wall), in which Mom had to leave work to calm me down. My first art contest win at the age of eight at the San Francisco Zoo was I felt well deserved as I'd put a lot of time and thought into my fairy princess drawing (with floating stars). After receiving two scholarships for art, I studied fine art and design in Illinois and my home town of San Francisco. I scored my first job as an illustrator and graphic designer at the age of seventeen. My entire career has revolved around fine and commercial art, from running my own graphic design and illustration business to selling commissioned watercolor portraits, animating video games, designing websites and corporate logos... you name it. When I’m not freelancing, cooking, gardening, sewing, watching scary movies with my husband or singing and playing Hawaiian music with my ukulele band, you’ll find me painting. 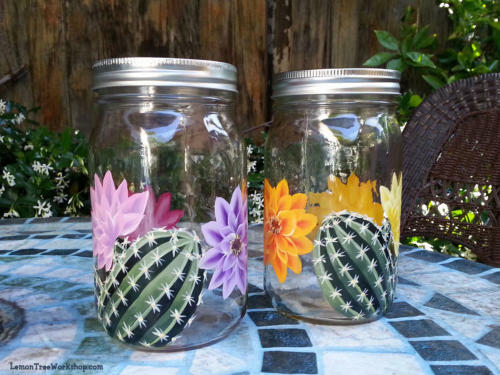 Cindy: How did you get started with decorative painting? Brenda: My mother-in-law started taking one stroke classes and she treated me to a workshop taught by local southern California artist April Numamoto. I didn’t know what I was doing but I had so much fun, and it was easy to get hooked. My MIL would have painting parties and would bring me to April’s classes and I’d learn the strokes, observe the students and their work. I decided that I wanted to pursue it as a career so I got certified by April in one stroke painting Levels 1 and 2. She is one of the best decorative painters I've ever seen. Cindy: When and how did you begin selling your work? Brenda: I’ve been selling my own handmade creations since I was a child. To me, selling macramé belts and embroidered bags was a more enjoyable way to make spending money than babysitting. I’ve been an employed artist for pretty much most of my life, and it seems that every career I’ve had has helped me gain experience to do what I do now, from writing, product and social media marketing, web design, photography to graphic design – all of these skills are needed to be able to create the final product. I started selling my products on Etsy last November and it’s been nonstop commission work ever since - and I love every minute of it. Helping someone design a completely unique gift is very fulfilling. Cindy: I've been pouring over the gorgeous photos in your gallery. In addition to glassware, you paint on ukuleles. How did that get started? Any other interesting items you've painted, besides the bowling pins? Brenda: Thank you! I’ve always loved to sing and about 7 years ago I bought a ukulele as a mini back-up band for myself. I remember my husband challenging me to give him a concert at the end of the weekend, so I spent an entire day learning how to tune it (typically a 30 second process) and the next day learning how to play 3 chords. On Sunday night I was able to play a barely recognizable version of Amazing Grace and he was so proud of me. Not long after I joined a Hollywood group, the teacher heard me sing and asked me if I would get up on stage in Little Tokyo and sing a Chinese song? What? I said sure. I learned how to sing a popular song Tien Mi Mi phonetically and that started my association with that group and a love of ukulele that has spiraled into a whole new world of friends, fun and music. Playing the ukulele is very addictive. 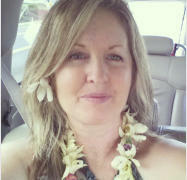 I also love to sing Hawaiian Music and my band plays private parties and luaus in the summertime. As far as other items, I’ve painted lamp shades as part of a restoration project. I painted a cherry blossom mural in my bathroom. Once you’ve been to Italy and seen every square inch of every building tiled with mosaic or hand painted, the bare walls at home aren’t going to cut it anymore. I painted my mural in our tiny second bathroom, and it got so hot in the summer it took forever. My friend Linda said it probably took less time to paint the Sistine Chapel. Ha! I think she’s right. Cindy: I love all the beautiful flowers you've done, especially the iris, the bird of paradise, and the stargazers. And the snowmen are so cute! And the cacti are stunning. I see a dog, a cat and a hippo, but no rabbits. Perhaps you need a model? Seriously though, where do you get your ideas? Brenda: I love anything to do with gardening and home décor. I love collecting china and unusual items like vintage Japanese toys and Hawaiian dresses and crocheted potholders. I think I just like to collect things. I’ve had a career as a graphic designer, video game animator, online dating spokesperson, etc. but I’ve always harbored a secret wish to be a giftware designer. Now, thanks to Etsy, I am able to make that wish come true, even if it's on a small scale. I have an ongoing ‘New Idea’ list that I never seem to have time to get to, so I’m thrilled when someone asks for something original and new because I get to add that item to my collection. I try to keep my work as original as possible, because that's the hard part. The designing. I studied for many years to be a designer. Painting is a different story. That came easy to me at a young age. You can learn to perfect your painting skills, but being able to create something that's uniquely yours is truly valuable. 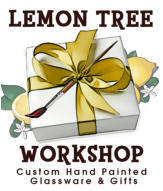 Cindy: What's the significance behind the name Lemon Tree Workshop? Brenda: I wanted a cheerful, approachable name that hadn’t yet been used. I live in a 1929 traditional Spanish home that was once owned by MGM studios and I paint in my workshop out back in the garden. Although my garden is small and I have a few different kind of fruit trees, the Meyer lemon tree has always been good to me. I've been able to make lemonade cake, flavor salmon dishes, make morrocan lemons, lemon drop drinks, etc. Yum! If I were president, everyone would have a Meyer lemon tree. Cindy: What is the best thing about your job? What are the challenges? Brenda: The best thing is that I get to manage my own time. I get to study and implement new marketing strategies. I get to experiment with photography. The challenges come around the holidays when I have to guesstimate how many orders I can accept before I reach the point where someone might not get their order in time. Another challenge is to make sure that when someone purchases a piece, that I find out if it’s a going to be a gift or not so I can make sure the recipient gets a hand written card. Sometimes people don’t tell you that they have a deadline and it’s my job to find out so everyone is happy. Cindy: How did you come to be the one to decorate The Craftys trophies? Tell us a bit about that process. Did you design them as well as painting them? 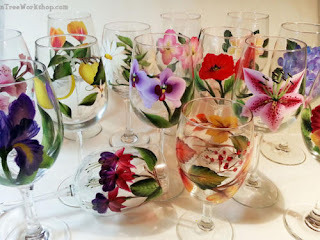 Brenda: I belong to a pretty large decorative painting group on Facebook, and someone posted that they were going to be featured in The Society of Decorative Painters Magazine, so I looked up their site and saw a link to The Craftys contest. I love to enter all art related contests. I've won a few; they're hard to resist. I entered my hand-painted Cherry Blossom ukulele (and a few glass pieces) and the uke was picked as a finalist in the decorative painting category. I received an email from CraftFoxes and was asked if I would paint the trophies. I could see the finished design in my head so I sent over a photoshop comp, then it was tweaked and approved fairly quickly. 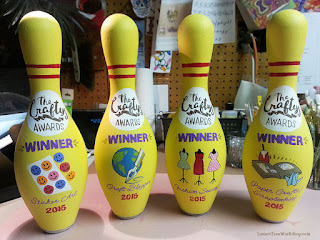 There were 17 categories and I have experience with pretty much every craft out there from sewing to crochet, so it was easy for me to design each bowling pin. We found the pins on Craigslist and had them shipped over to me. 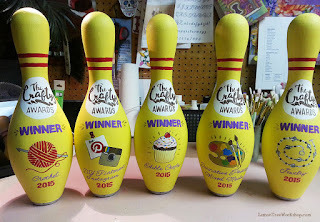 They were plastic coated and all beat up and well loved so they had to be primered a few times, painted a few times, then the hand lettering, then the images were painted, then they were sealed with a varnish, and delivered to San Francisco for the contest. I had a lot of fun painting them. I think my favorite pin is the quilting pin. I really love what I do. I think that's the key to living a good life. 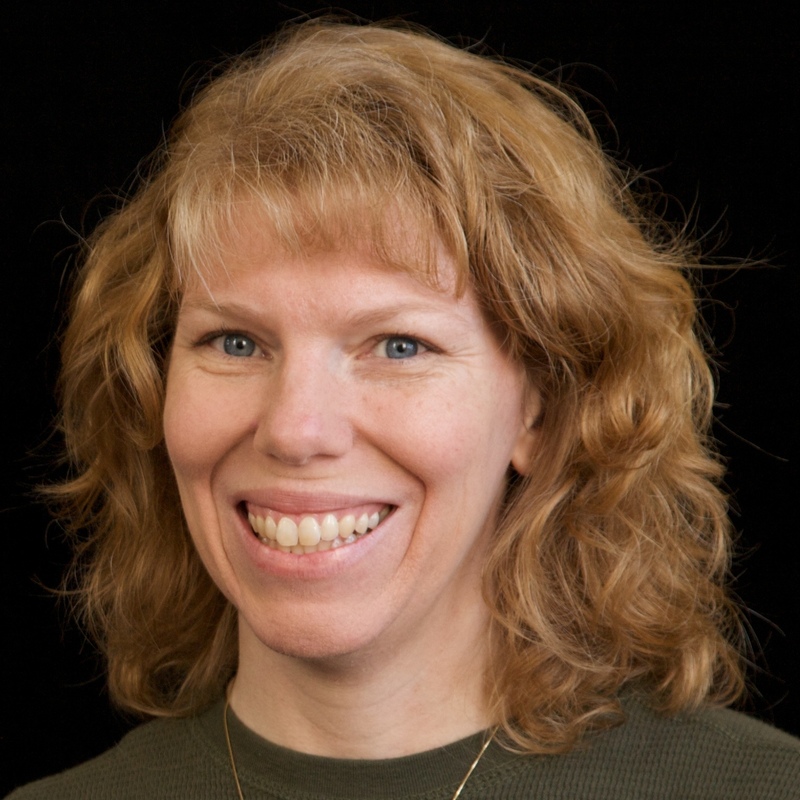 Cindy: Brenda, thank you so much for your time! You can find Brenda at her website Lemon Tree Workshop, on Facebook, on Instagram, on Pinterest and at her Etsy shop. Go check out her gallery and start thinking what you'd like painted on a glass, mug, ukulele or bowling pin! What a great interview! Her work is beautiful!!!!!!!!!! 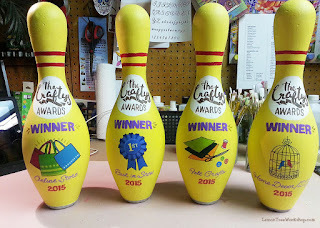 I've never heard of the Craftys but I LOVE those painted bowling pin trophies. Those are so fun and creative. Nice interview. She is so talented. Those bowling pin trophies are beautiful. I was wondering who made them for the Craftys.